Let us get started with Beyond the Headlines, focusin on the legacy of the Chernobyl disaster – a disaster that changed the lives of hundreds of thousands of people and came as a major test for the environment and man’s ability to handle man-made disasters. Recent reports from the Chernobyl plant, located some 70 miles from Kiev and 10 miles from the border with Belarus, are by no means optimistic. Mira Salganik: There is no guarantee that one day Chernobyl will not become a major problem again. Sergei Strokan: Radiation doesn’t recognize borders drawn on maps. This is a threat both to the former Soviet republics that have already experienced Chernobyl’s aftermath and also to neighboring European nations and even maybe to other, more distant lands. Sergei Strokan: What do you think of today’s nuclear paranoia? Sergei Strokan: And Chernobyl, for millions of us living in the post-Soviet territory, has become a symbol, or metaphor. In addition, everyone has his own recollections of Chernobyl – it can be painful, scary, angry and sometimes totally unexpected and confusing. Mira Salganik: A really striking thing about Chernobyl is that no one seems to know the exact figures of the death toll. There is no other catastrophe of such magnitude in the world that is so poorly documented. There are so many contradictions; you cannot find facts and figures you can really believe in. Sergei Strokan: At the recent sixth All-Russia public forum “Atomic energy, society and security” held in St. Petersburg, Rosatom’s Deputy General Director Alexander Lokshin said that Russia’s nuclear industry has learned many lessons from Chernobyl. According to him, the reactors of operating and currently built nuclear power plants in Russia can resist a 14-meter high tsunami and fall of a plane of 400 tons. However, even such arguments don’t calm down the public, which is understandably traumatized by the psychological factors of Chernobyl and Fukushima. Mira Salganik: It doesn’t convince me. I trust what Mr. Lokshin said, but can this system resist a human error? Meanwhile, cash-strapped Ukraine is raising money to construct a new cover for the reactor. An international donor conference of 35 countries and international organizations, held in Kiev last week, raised some 550 milion euros—more than a half of the sum required. Sergei Strokan: Oh, yes, the European Commission allocated 110 million euros; Russia, 86 million; the United States, 45 million. What matters, of course, is not the amount of individual donations, but the display of solidarity and common understanding that Chernobyl is everybody’s problem. Mira Salganik: And this is precisely why President Medvedev, speaking at Chernobyl, said that it is very important for leaders to tell the truth to their nations and to the world. Do you think that Fukushima has prompted many changes in this respect? Now we have an interview Ekaterina Kudashkina conducted with Jan Haverkamp, the Greenpeace European Unit Policy adviser on energy and an expert on nuclear energy issues. Ekaterina Kudashkina: First of all, I have seen a wonderful title on your website: Chernobyl 25 years later – a stark reminder of Fukushima’s future. Jan Haverkamp: One of the things we have seen in Chernobyl during these 25 years is the devastating influence on the local economy, devastating influence on the development of the country, and devastating influence on the health situation of people who lived around Chernobyl. It is really likely that we see this influence also in Japan. Ekaterina Kudashkina: From the European perspective, just how would you describe the fallout from Chernobyl, 25 years later, do you still feel the impact of the catastrophe? Jan Haverkamp: There are two things that I think we still feel: First of all, the health situation of people around in Ukraine, Belarus and in Russia. We see still in very many places in Ukraine people dependent on local produce that is still very actively contaminated. And in those areas we see a high amount of miscarriages, a high amount of secondary diseases, and also a high amount of cancers. Very often doctors do not directly relate these illnesses to the radiation from Chernobyl, but it has definitely to do with the catastrophe of Chernobyl. The second issue is that the sarcophagus around Chernobyl has to be replaced, and that is going to cost a lot of money. We hope that it will be replaced in 2015 or 2017, but that is only the start of the work because the old reactor will have to be dismantled; and that is going to cost again another few billion euros. Ekaterina Kudashkina: Have these two catastrophes raised public awareness regarding issues of nuclear safety? Jan Haverkamp: In this history of nuclear power, we have seen in total now six meltdowns. The meltdown is a situation that is supposed to take place fewer than one time in 10,000 years. That should raise the alarm I think. It is obvious that the technology that is more complex than before, and we do see a change in thinking in very many countries. Mira Salganik: What is so dangerous about the True Finns that alarms Brussels to such an extent? Sergei Strokan: I think the Financial Times tries to give an answer. To quote Tony Barber, by catapulting themselves from nowhere to a close third in the general election, “the True Finns have made it difficult for the next Finnish government to approve the financial rescue measures considered in Brussels to save EU member-states that find themselves on the brink of default. Let me remind you that the decisions in European Union are taken by consensus. So, Finland can simply block any joint efforts to save countries in a risk zone, be it Ireland or Portugal. So what is at stake is probably the future of the euro-zone. Mira Salganik: Who are these people? Sergei Strokan: The party is led by Mr. Timo Soini, a 48-year old social sciences graduate of Helsinki University, who joined the True Finns in 1995. Two years later Timo Soini became the most true finn among the True Finns – he was elected Party Chairman. And it took him another three years to become a member of the European parliament to join euro-skeptics there. Timo Soini is known as a very effective, down-to-earth speaker. Mira Salganik: I believe they were able to find convincing arguments for the voters. You can look at the figures: Finnish unemployment stands as of today at 8.4 percent of the workforce. Finland is a small country, so it is quite a lot. Jobs are disappearing abroad. Paper and pulp mills are shutting down. Sergei Strokan: And Finland is a small country, so when a factory closes in a small Finnish provincial town, the impact is stronger than in bigger countries. All in all, it is clear that the True Finns’ spectacular rise has to do with resentment of those who have lost – and go on losing – from globalization. Naturally, the True Finns and parties of this type exploit the situation. Mira Salganik: This is very, very serious, at least to me. Number one - this is a pan-European trend, isn’t it? The True Finns are simply adding their voice to a loud chorus protesting against European unity, against all it stands for. The question now is, would the withdrawal from this unity help the nations of Europe or further aggravate their present troubles? Sergei Strokan: For more discussion of this, we can turn to our next guest speaker Arkady Moshes, the director of the Russian program at the Finnish Institute of International studies in Helsinki. He was also interviewed by Ekaterina Kudashkina. Ekaterina Kudashkina: Mr. Moshes, thank you very much for joining us! Could you tell us a little bit more about that True Finns party? Arkady Moshes: Their success is partly due to the combination of certain factors about which Finnish society feels particularly strong at the moment. One of the appealing slogans of the party was talk about the need to do something about immigration, but on its own that would not have been enough, so the more important contribution to their victory was actually the position concerning the bailout of the European countries of the south that are in debt. Ekaterina Kudashkina: Why did people vote for them? Arkady Moshes: I would say definitely there is a resentment of having to keep funding the states that are not able to live on their own funds. The states that have better social security, better taxation, better fiscal systems and better working institutions cannot be expected endlessly to fund the countries that really do not want to live on that axis. But I would not go that far as saying that Finns are tired of integration; rather, they want the whole mechanism of the EU integration to work better. Ekaterina Kudashkina: Can we elaborate a little bit on how this sentiment could influence Finland’s relationship with the European Union? Arkady Moshes: That will depend on the government. We will know the outcome when the negotiations [to form the government] are over, which is probably about one month from now. At this point, I would not go too far and say that the whole relationship between Finland and the European Union will change. The True Finns received less than 20 percent of the overall vote. It is important, but it is not enough to change the whole approach of the country. Let us not forget that up until now, for 16 years, Finland’s main line was to be in the core of the European Union, and it always wanted to stay as close to the center as possible, it is the only Nordic country that is in the Euro zone, for example, and it is not easy to challenge these fundamentals. Ekaterina Kudashkina: What is the position of True Finns on the immigration issue? Arkady Moshes: It is a bit difficult actually to speak about the position of the whole party. In the party there are certain public figures and public speakers who express clear anti-immigration views. But the leader of the party speaks in very cautious political language. I think what they are up to, is of course a tighter immigration policy, but I would also say better targets for the immigration policy, because the problem with the Finnish immigration policy is the idea that one size fits all. As a result of this policy, even though there are no proper quotas as such, there are be possibilities for people to exploit the Finnish welfare system by means of applying for family reunification or political asylum. No response would be negative. But we should be aware of the fact that the policy has already begun to change. There has already been talk about separating people who are better able to integrate, learn the language, who are willing to work and to contribute to the Finnish welfare system from those who would rather use it. I would insist that the anti-immigration part of the platform of the True Finns is not the most important part. Ekaterina Kudashkina: Just to sum it up, the victory of the True Finns in the recent elections should not be seen as something extraordinary, but perhaps as a signal pointing to certain imbalances in the European policy? Arkady Moshes: I would say yes, it points to a certain deficiency of the EU policies as they are perceived in Finland, but of course it shows how democracy works. If there is strong people’s discontent or frustration about certain issues and if there is a party which wants to voice this concern, even if some people believe this party is populist, it should be given a chance and they should be given a chance to work in the government and to prove that they are worth people’s confidence. Sergei Strokan: And now we move on to the Red Line’s third heading – Man in the News. This time our obvious man in the news is another patriarch of Mideast politics, embattled Yemeni President Ali Abdullah Saleh. Mira Salganik: So, Yemen is obviously turning into another Middle East drama following Tunisia, Egypt and Libya. 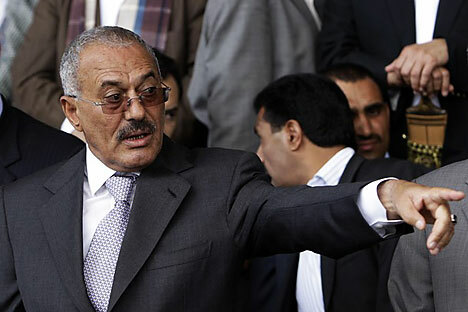 The most interesting aspect of it is that President Saleh is trying to invent his own political survival kit by combining the experience of both Egyptian President Mubarak, who stepped down voluntarily and Libyan leader Muammar Gaddafi, who is fighting for survival tooth and nail. Sergei Strokan: It is not the first time in recent months that President Saleh is playing a cat-and-mouse game with the opposition. He tried a similar trick in March. First, he used riot police to disperse angry crowds with bullets and tear gas, than he entered into negotiations with the opposition and later he withdrew from negotiations and again reverted to brutal force. Mira Salganik: So, you may say the situation in Yemen repeats itself. It looks like a vicious circle. But the problem is that the tension in the country is dramatically mounting with every passing day. And the question is – what next? I have noticed a feature common for all Mideast stories. All autocratic leaders – ousted or still in power are trying to play the same trick: Once their rule is in jeopardy they start warning of the dangers the world if they have to turn to step down. Sergei Strokan: That’s right, and there is another interesting fact. While Saleh warns of militants and chaos in a country containing more than 12 million guns, the protesters have not fired a single shot. So, it seems that there is less and less justification for his continued rule, isn’t it? Mira Salganik: I think what is really threatening in Yemen now is almost eminent – the West would call it a civil war – I would call it a tribal or a clan war, and that would really destroy the country. Sergei Strokan: Let us discuss it with our expert Andrei Stepanov, an independent Russian analyst on the Middle East and North Africa policy. He is interviewed by Ekaterina Kudashkina. Ekaterina Kudashkina: Mr. Stepanov, thank you very much for joining us. How shall we explain to our listeners what makes President Saleh so invincible? There have been protests for such a long time and he is still in power. Andrei Stepanov: There is another question – why should he be removed from power? Because Yemen – we must acknowledge it – is a very unique country. I would like to credit Mr. Saleh with sagacity and wisdom in governing this country for the first 10 or probably 15 years. He managed to quell the rebellion of the northern tribes, he managed to unite the country, and his main asset was to involve chiefs of the tribes who accumulated huge money in trading their loyalty to the monarchies and to the republics, and he made them invest that money in the development of their respective tribal regions, building roads, setting up modern communication systems, building hospitals, schools, etc. He even managed to preside over the unification of both sides of Yemen, northern and southern, in 1990. But as the time passed, you know, every power is corrupt, but the absolute power is corrupt absolutely, this is the thing that happened with the current regime in Yemen. Today this unstable country faces three challenges: the potential rebellion of the tribes in the north, the developing secessionist movement in the south and the challenge of al-Qaeda in the Arabian Peninsula. So the way of thinking of Mr. Saleh is: If I leave now, the country will split up into several small states, and it will mean a civil war, that’s why he is reluctant to leave immediately. He says, “I am ready to go but I must leave the country secured against splitting, against division, against dissembling,” and this is the point to his credit.